Trail-pod products allow you to mount any trail camera exactly where you want it quickly and easily! The Tri-pod Deluxe Model works well in areas without trees, on uneven or frozen ground, and near food plots. The Tri-pod model consists of: a universal mounting plate, camo stretch cords, a heavy duty ball head, a green or camo tri-pod, and tri-pod feet with anchoring stakes. The universal mounting plate features specifically positioned holes and locking slots allowing you an unlimited number of ways to mount your trail camera to the plate. The mounting plate design allows you to use your trail camera's factory strap or hardware to mount your trail camera to the mounting plate as well. 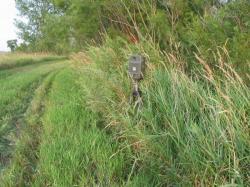 The heavy-duty ball head allows you to adjust your trail camera to the perfect angle, no matter what type of terrain. The specially designed tri-pod feet and anchoring stakes provide stability against high winds and animals. Quick and quiet setup limits the intrusion in your hunting area. Just set the Tri-pod and go! Unlimited trail camera placement possibilities mean better pictures!